Pyrophosphate is a salt or ester of pyrophosphoric acid, containing the group P2O7. In chemistry, a pyrophosphate is a phosphorus oxyanion. 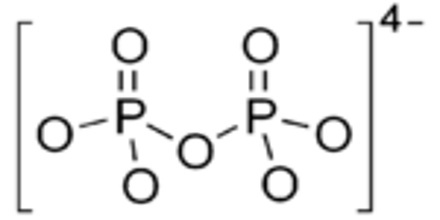 The group is also called diphosphate or dipolyphosphate, although this should not be confused with phosphates. As a food additive, diphosphates are known as E450. It is added to canned tuna and a lot of other preserved foods to prevent colour changes due to oxidation. Most of these additives with strange sounding names perform functions like this: prevent colour changes, make a red food more red, preserve freshness, moistness, dryness. The term pyrophosphate is also the name of esters formed by the condensation of a phosphorylated biological compound with inorganic phosphate, as for dimethylallyl pyrophosphate. 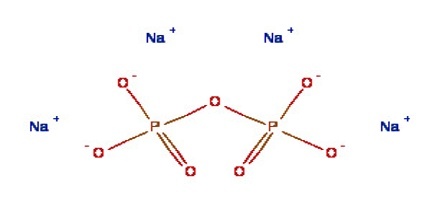 This bond is also referred to as a high-energy phosphate bond. The synthesis of tetraethyl pyrophosphate was first described in 1854 by Philippe de Clermont at a meeting of the French Academy of Sciences. Pyrophosphates were originally prepared by heating phosphates (pyro from the Greek, meaning “fire”). They generally exhibit the highest solubilities among the phosphates; moreover, they are good complexing agents for metal ions and have many uses in industrial chemistry. 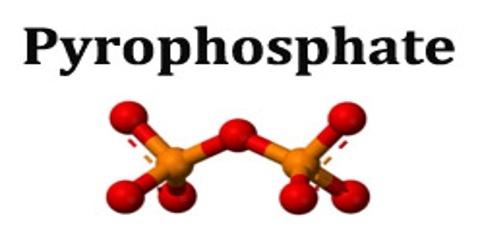 Pyrophosphate is the first member of an entire series of polyphosphates. In biochemistry, the term pyrophosphate (PPi) is used to refer to chemical compounds that encompass the esters, salts, and anion of pyrophosphoric acid. Pyrophosphates are very important in biochemistry. The anion P2O74− is abbreviated PPi and is formed by the hydrolysis of ATP into AMP in cells. Variances in energy load in phosphorylation reactions with proteins and other organic molecules produce different forms of pyrophosphate. The final result will always contain one of these ions, however. For instance, farnesyl pyrophosphate is obtained through the synthesis of hydrocarbons known as terpenes. Dimethylallyl pyrophosphate is a byproduct of mevalonic acid. The plasma concentration of inorganic pyrophosphate has a reference range of 0.58-3.78 µM (95% prediction interval). Sodium pyrophosphate has many applications in the food industry as a chelant and thickening agent. In combination with cornstarch, it is a primary ingredient in Bakewell Baking Powder, which gained notoriety during WW II when regular baking powder became scarce. 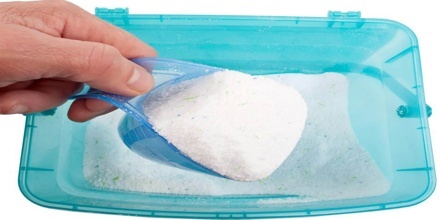 This powder is still sold today as a gluten-free alternative to baking powder and cream of tartar. It is also a common food additive found in frozen foods, ready-made puddings, and some soy-based products. 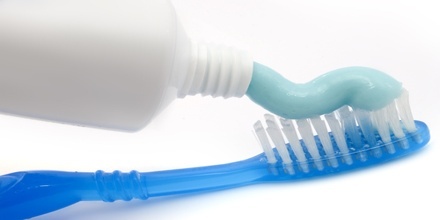 Calcium pyrophosphate is also an additive to dental floss and toothpaste, although this chemical compound is best known for facilitating an arthritic condition called calcium pyrophosphate deposition disease (CPDD) due to an accumulation of dihydrate crystals in the synovial fluid and tissue that surround the joints. Reference: dictionary.com, wisegeek.org, quora.com, wikipedia.